Tackle your family's summer travel bucket list with the best of the best — Disney. Raise your hand if you think the Disney brand is only about theme parks, animated shows, movies and family cruises. If you’re in this large majority, you’re about to learn how much more Disney can offer you and your family — Adventures by Disney. Where do you dream of vacationing with your family? Without a theme park or character in sight, the Disney you trust will guide you to your bucket list travel spots with the safety, comfort and attention to detail you expect. Explore the world in ways that your entire family will enjoy. "Adventure Guides" and local experts immerse you in the culture and traditions of your chosen destination, welcoming you with open arms as you participate in customs and rituals at each location you visit. I know all about Disney’s legendary service. After all, in more than 50 visits to Walt Disney World, Disneyland and the Disney Cruise Line, I am confident doing anything with Disney. Legendary service, extraordinary safety measures and thorough storytelling are the three hallmarks of any Disney vacation. I went to Costa Rica with a group in April and the itinerary blew me away. We went coast to coast and saw the entire country in seven days with equal parts activity and relaxation. We were completely immersed. It was wonderful that our "Adventure Guides," Landon and Costa Rica native Ronald, were phenomenal. I like to tell anyone who will listen that they were always three steps ahead of our wants and needs. Carrying luggage? I never touched it, yet it magically showed up in my room at each stop. My wallet? Never touched it. All tips, admissions and fees were included. My group was immersed in the culture and country instead of getting off a plane, struggling with a map, questioning our surroundings and disagreeing on plans for the day. When I returned home, I told my husband this was the only way I could ever vacation again. To my surprise, he told me to find an adventure for our family during the summer! Our 16- and 22-year-old sons were thrilled to learn we were going to Arizona and Utah. We joined children as young as 6 and grandparents in their late 60s. We bonded, exploring Sedona, the Grand Canyon and a total of four national parks. 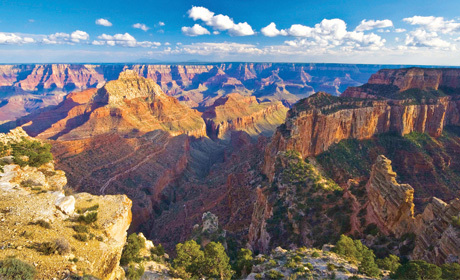 With Adventures by Disney, you don’t make three-year-ahead reservations to stay IN the Grand Canyon National Park, you’re there. You don’t stay one hour away; you are 200 yards from the Canyon. We took unforgettable Pink Jeep rides, counted National Arches, rafted, viewed Saturn through a powerful telescope, hiked and much more. I will never forget or regret one second of this time with my family. Adventures by Disney offers 36 different destinations. With one local guide and one Disney guide on every trip, you’ll never worry about safety, food allergies/health issues, waiting in lines at sights like the Eiffel Tower, internal Adventure flights, airport transfers or so many other travel concerns. Junior Adventurers can experience an art detective game in the Louvre Museum or stomp grapes while adults get a “taste” of wine-making history, or as a family, how about a leisurely bike ride amongst breathtaking scenery! This worry-free travel was designed with families and groups of friends in mind. Adult-exclusive and small private group tours are available. You’ll find insider access to museums, theaters and more — what are you waiting for? Have a Tough Time Selecting Your First Adventure! Living kings and queens of yore with a stay in Dromoland Castle. Trying the age-old Greek tradition of cheese making with a local shepherd. Learning Tai Chi from a local master with the gum drop mountains as a backdrop! Dining privately among priceless works of art inside the famed Louvre Museum. River Cruising in Europe is HOT, and Adventures by Disney is the best of the best. Right now, Disney offers excellent special offers on Danube river cruising: $1,000 per child/teen OR $500 off per adult on most Summer 2017 sailings is an incredible deal. Montana. Alaska. New York. Winter in Wyoming. San Francisco. These and more North American locations are easy travel destinations. See Europe 14 different ways, including three options in Italy. What about an African safari or a holiday Down Under? Equador and the Galapagos on your list? Yes! They have two ways to do that, too. You can go to China, yes, and also Southeast Asia. I have met families on their 10th and 11th Adventures. Yes, they are addictive. So the only question is ... Where are you going first?